Did you get roses for Valentine's Day? 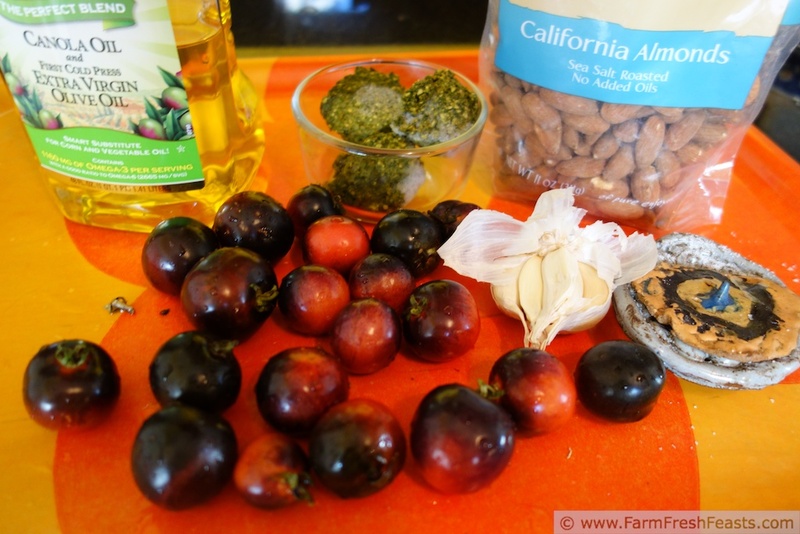 After reading about this pizza sauce, I bet you wish you'd gotten Indigo Rose tomatoes from your local Community Supported Agriculture farm share instead. One of the reasons I love my CSA is the variety of colorful produce that shows up in the box each week. It's like my own personal Iron Chef challenge to figure out what to make with each week's box full of secret ingredients. And the taste--fresh produce just tastes so much better. If you've never heard of a CSA farm share, check out Local Harvest. There you can use your zip code (in the US) to search for CSA farms that deliver to locations near you. Late winter is the time to join a CSA. By paying in advance you enable your farmer to purchase seeds and repair equipment at the beginning of the growing season. In return, you get a share of the farm fresh produce all season long. You're supporting a local business and you get to taste delicious veggies like these Indigo Rose tomatoes! Not really. When I made the spinach dough I knew that I was going to continue to explore adding veggies from my CSA farm share into my family's pizza crust--not just on top of it. But where to start? To not quote a Monty Python film involving a lecture in a British boys' school, I can't go leaping into, for example, mustard green pizza crust. Though the idea is intriguing . . . I wonder what I'd top it with? More greens? Bacon? Ahem. Move your coat to the lower peg and let's move on. Instead of going to the freezer stash for slow-roasted tomatoes, or pesto, or pumpkin to try in a crust, I turned right and looked at the Strategic Winter Squash Reserve. Specifically, because they stand head and shoulders above the rest (get it? above?) the Larch the butternut squash. I'd had my epiphany-while-showering about shredding a butternut squash, so I had some shredded butternut squash on hand to play around with. And play I did! 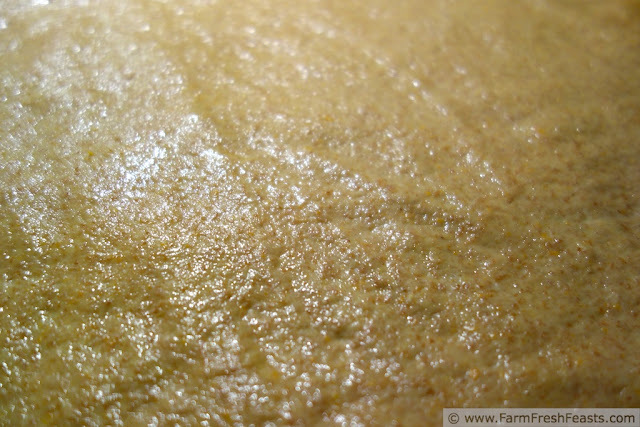 If you're on my Farm Fresh Feasts Facebook page, you've seen the golden and pillowy eggnog and butternut squash crust. The recipe will be up here during eggnog season, because I'm all about eating seasonally with my CSA vegetables (and good deals on eggnog after the holidays). But in reality it is a Five Cheese Pizza with Funky Orange Purple Indigo Rose Tomato and Almond Pesto on a Butternut Squash Crust. And with that lofty name, let's get to it--shall we? Anyone else see moonlight on the ocean in this one? I wrote up a long post about general pizza-making hints and tips--you can find my Pizza Primer here. 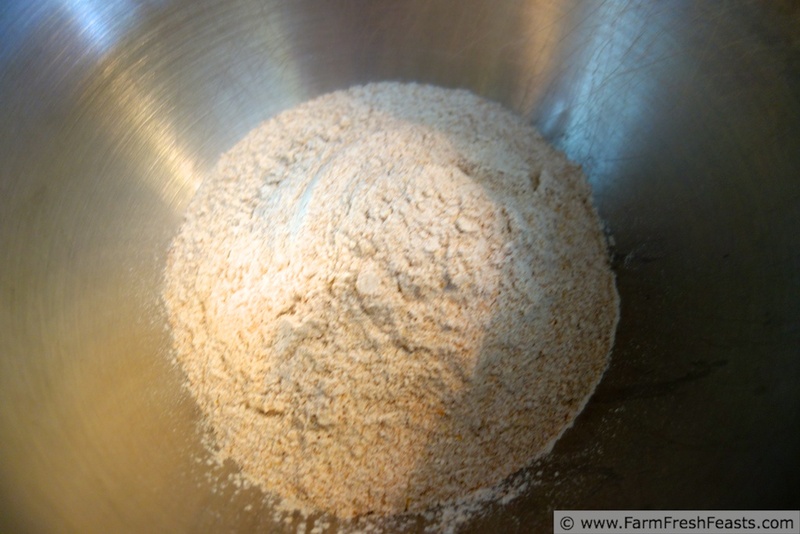 Add yeast to 3/4 cup water to let it dissolve and get ready for the day's meal. Set aside. In a large mixing bowl (I used my stand mixer), place squash and salt. Stir briefly to combine. Pour in yeast. Dump flours on top. Start mixing (I use my paddle here), adding the oil as the dough gets stiff. A few minutes after the ingredients have combined, if the dough still seems rough, add a tablespoon of water and give it a few minutes to work in. Because you're working with a vegetable, the water content of any given squash will be different and I want you to go slowly adding additional water. Continue mixing until the dough pulls away from the sides of the bowl and makes a ball around the paddle (you may need to add another tablespoon of water to your dough). You'll see streaks of squash throughout. 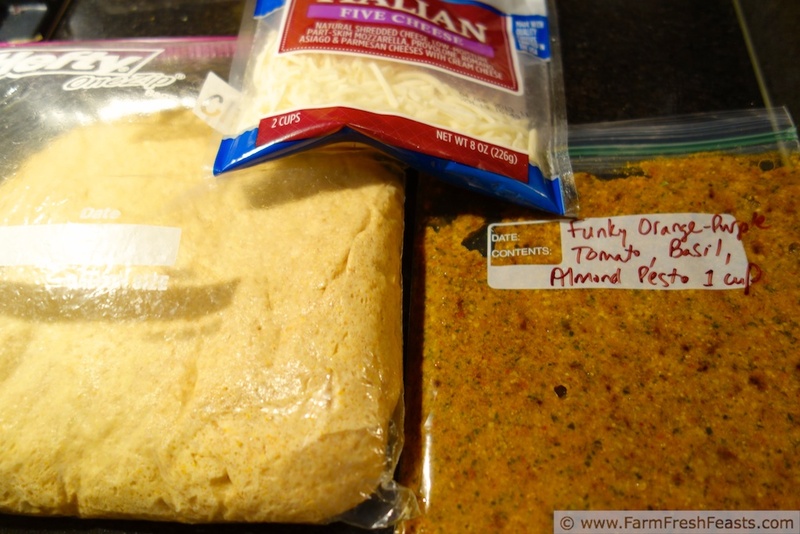 Place into an oiled container (I use a lidded bowl or a gallon size zip top bag, depending on the free space in my fridge and how long until I'm going to turn the dough into a pizza) and set aside. If you're going to use it right away, divide the dough in half and place each ball on an oiled piece of parchment and keep on reading. You can make the dough up to 3 days before you're going to bake, just toss it in the fridge and bring it out a good 30 minutes before you start to preheat your oven so it is pliable and easy to work when you're ready to make the crust. Preheat oven to 450 degrees Fahrenheit. If you have a pizza stone, place it in the oven (mine never leaves!) to preheat as well. On an oiled piece of parchment, stretch out the dough into the shape that strikes your fancy and yet also works well for a pizza. Top with the sauce of your choice, spreading thinly nearly to the edges. [If you've frozen the tomato pesto when tomatoes are ripe for you, drain off the bit of fluid that accumulates at the top of the container. It's delicious if you're tossing this with a pasta, but makes your pizza too wet.] Scatter cheese evenly across the top. Perhaps add a shrubbery, not too expensive, with a nice picket fence Bake for 5 to 8 minutes on the parchment paper (on a stone or cookie sheet), then shake the dough directly onto the baking platform to finish for another 3-5 minutes until the cheese is browned and bubbly. Cool on a rack a few minutes, then slice and serve. What is your quest? What is your favorite color? What is the average air speed of an unladen swallow? What am I even talking about?? Do you participate in a CSA? This post is shared with the Creative HomeAcre Hop and the Farmgirl Friday Blog Fest at Let This Mind Be In You, the Wednesday Fresh Foods Link Up at Gastronomical Sovereignty, Taste and Tell Thursday, Food on Friday and What's In The Box at In Her Chucks (source of that great tomato pesto recipe!). 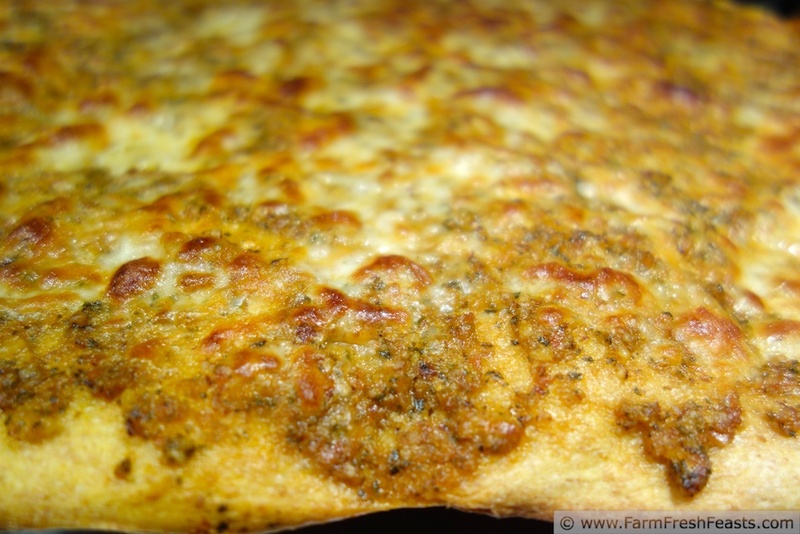 Love this pizza + its slightly different twists on the traditional crust/toppings flavors. yum! Keeping it just a bit off center means that my cheese-pizza loving daughter will eat it, but the rest of us get to try new things with the second crust. And I get to play with all the goodies in my CSA farm share, so it's a win-win. Instead of going to a restaurant on Valentine's Day, I should just come to your house so you can feed me! You would have loved our Valentine's day meal, too. I picked up a package of heart-shaped cheese-filled ravioli at Costco, tossed them with sour cream & milk, dunked each one in breadcrumbs and Shake Shake, then baked them. Served alongside some spaghetti sauce I'd put up in the fall, and a salad, with cake for dessert. I will never, nah, won't say never, how 'bout I have no desire to boil ravioli ever again. Baked is so much better. This is interesting. 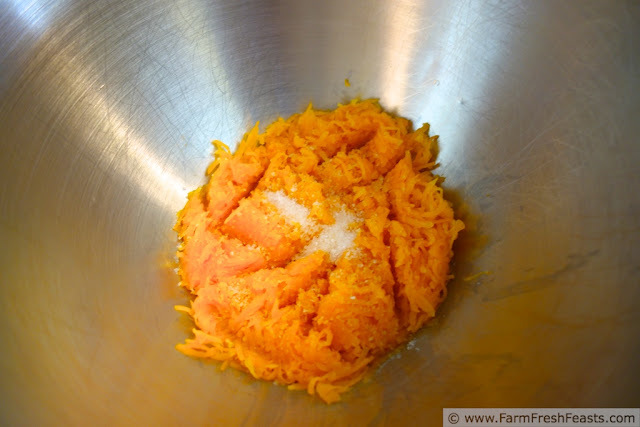 Do you think a butternut squash puree would work as well as the shredded squash? I have lots of puree in my freezer right now, and I love sneaking in veggies when the kids don't know it. You have no idea how happy I am that someone outside of my family gets my references! I sure do think squash puree would work, and that reminds me to use a cup of the Mystery Winter Squash I've got in the freezer in a dough. Just don't add the full amount of water the recipe calls for until it's mixed for a while and you can see if your dough needs more liquid. And let me know how it turns out--thanks! I am here for your Friday Pizza, and that pizza, my friend, sounds incredible!! I love that crust as much as all those delicious toppings. Beautiful recipe! It just makes me look even more forward to the summer, which is silly because I'm still enjoying winter and there's spring to enjoy as well. But I only have 2 packages of Heather and InHerChucks' recipe for fresh tomato pesto left . . . and after that I will be so sad. March will be a very green month here on the blog--Green Eggs No Ham on up through a Tremendously Green Pizza. I hope you find something that appeals. Don't do it! Start an occasional pizza treat night! If you do the weekly thing, then the family starts expecting the weekly thing. Just like the composting pigs . . . my spouse loves grapes, and started giving them each a slightly soft grape in the morning as he'd prepare his lunch. Then the pigs started loudly demanding their daily grapes (which is funny because they are 3 pounds but pack a lot of sound into that smallish package). I still find it an adventure to come up with new pizza ideas each week, so I'm loving it, but I see my spouse getting put upon by the pig monster he created, and I just want to warn you of the consequences. There are those who call me....Tim??? This is an awesome post and a killer pizza. You called your CSA box your own "Iron Chef" challenge - I think of it the same way! I love being a member of a CSA. I've cooked with veggies that I would never have tried otherwise. It's a great food adventure! Yay! Someone else with a memory for obscure movie quotes! I really think it requires a sense of adventure, like you say a food adventure, to initially join a CSA. Once you make the mental switch to the Iron Chef thing it's great fun, but if you're planning your menu out on Saturday then get a box on Wednesday you just can't flow properly. I bet butternut squash latkes are good. My most-favorite way in the world to eat zucchini is zucchini pancakes, so I could easily picture a butternut latke. Yum! I don't think it makes you lazy to get your dough from a great local source--it makes you practical and efficient and supportive of a local business. I mean, sure, I could tap the couple of maple trees in my yard and collect the sap and boil it down and make a couple of teaspoons of syrup, but it's more efficient to pick up a jug at the farmer's market. Which reminds me, I need to do that as we're nearly out. YUM! I have actually burned myself out on homemade pizza. But maybe by next week! I need to peruse your pizza variations and go to town! And I too have shower epiphanies. I had one this morning about scallops and vanilla salt as an appetizer, followed by citrus shrimp over citrus garlic quinoa. Date night menu (and two blog posts next week, if they work). I'm really enjoying your vanilla series, and scallops with vanilla salt intrigues me. On Fridays, Laura at Sprint2TheTable hosts a Strange But Good link up--you should share that post at her party! You continue to impress me with your wonderful pizza creations. A butternut squash crust sounds fabulous, and I would never turn down cheese, much less five of them. And the tomatoes are the icing on the cake so to speak. They look like cherries...so pretty, and I can't wait for the weather to turn and fresh local produce to start popping up again. Me neither, Meghan, me neither. Even the parsley and Swiss chard in my garden, which had made it into 2013, has given up in this cold. This looks awesome! And I got the Monty Python reference :) Found you on Farm Girl Friday! I would love to have you share this on The Creative HomeAcre Hop today! Thanks for the invite, and thanks for stopping by! Wow, this pizza sounds awesome! Gonna pin it. I really need to get on Pinterest--I also need to walk the dog and do the laundry. Something's gotta give! Thanks so much for sharing this on The Creative HomeAcre Hop! Hope to see you tomorrow on the next Creative HomeAcre hop! I'll be there--thanks for the reminder! 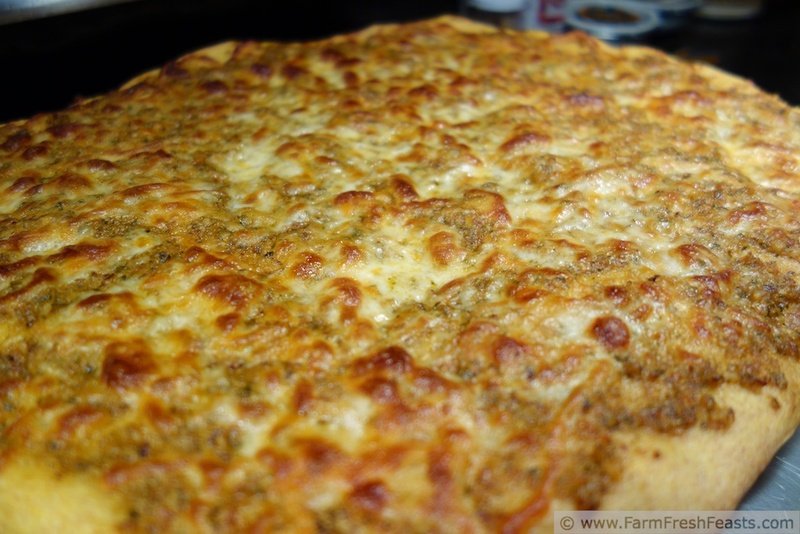 You had me at butternut squash crust...wowza! Butternut squash . . . it's not just for muffins anymore? Oh boy, this looks like another fantastic use for squash... so many recipes, not enough squash! Though I'm loving your other vegetable-infused pizza crusts as well, so maybe I will branch out a little from my beloved squash. Thanks for posting this, what a great idea. You're really right, so many recipes, not enough [insert name of vegetable here]. Though in the fall, when the farm share is handing me piles of squash, and greens and more each week it seems like it's the other way around: so many squash, so little room in my belly! Good thing winter squash stores so well.